Mediterranean Kale Salad with chickpeas, tomatoes, cucumber, red pepper, artichoke hearts, olives, feta cheese, pita chips and a simple hummus dressing. This post is sponsored by Sabra. The weather is warming up and that means lots and lots of salads! YAY! I may be known for my cookie obsession, but I love a good salad almost as much as a freshly baked cookie. Almost:) I am super excited for salad season. My current favorite salad is this easy Mediterranean Kale Salad with Hummus Dressing. I have been enjoying it for lunch almost every single day. I can’t get enough. I know it is going to be on regular rotation, especially during the hot summer months. 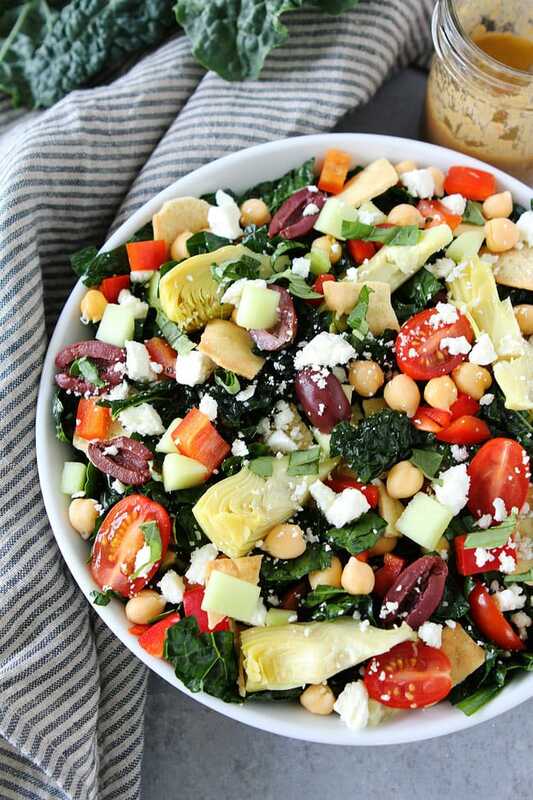 This salad has all of my favorite ingredients: kale, chickpeas, red pepper, artichokes, cucumber, tomatoes, kalamata olives, feta cheese, and pita chips. Plus, it is finished with a creamy hummus dressing that is out of this world good. You only need four ingredients to make the hummus dressing: Sabra Classic Hummus, olive oil, fresh lemon juice, and balsamic vinegar. 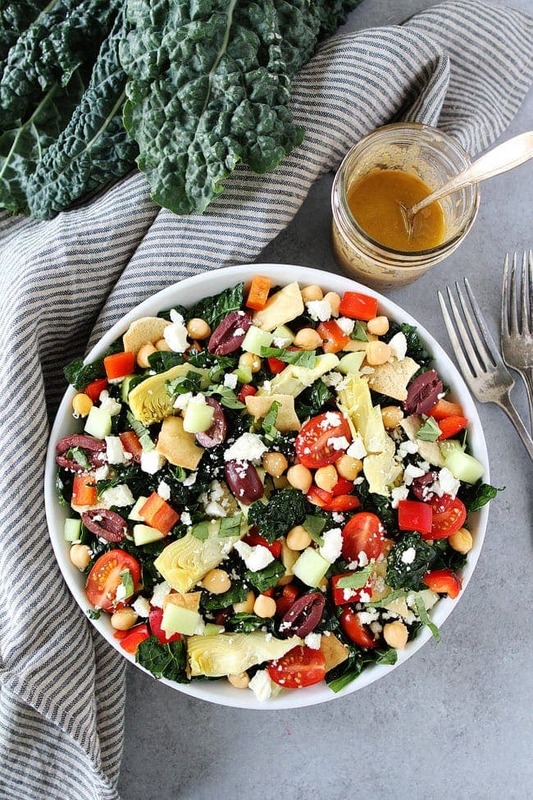 It is so good drizzled over this Mediterranean Kale Salad. It makes all of the salad flavors pop! I like to use Lacinato, aka dinosaur kale, for this salad. You can find it in the produce section at most grocery stores. I like to use Sabra’s Classic Hummus to make the dressing, but feel free to mix things up by using roasted red pepper, roasted pine nut, or roasted garlic hummus. You can serve this salad as a main dish or side dish. 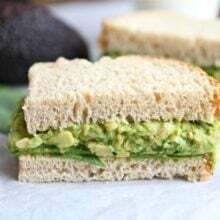 It makes a great easy lunch or dinner. It is also a great salad to take to summer potlucks and barbecues, just wait to dress the salad until you are ready to serve. If you need the salad to be vegan, you can omit the feta cheese. If you need the salad to be gluten-free, you can omit the pita chips. The salad will still be tasty! Did you know tomorrow, May 13th, is National Hummus Day? 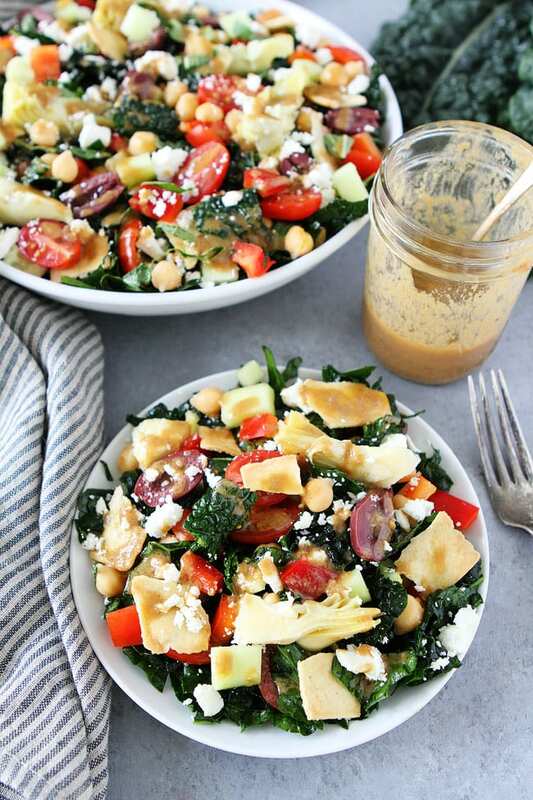 You HAVE to make this Mediterranean Kale Salad with Hummus Dressing to celebrate! Enjoy! 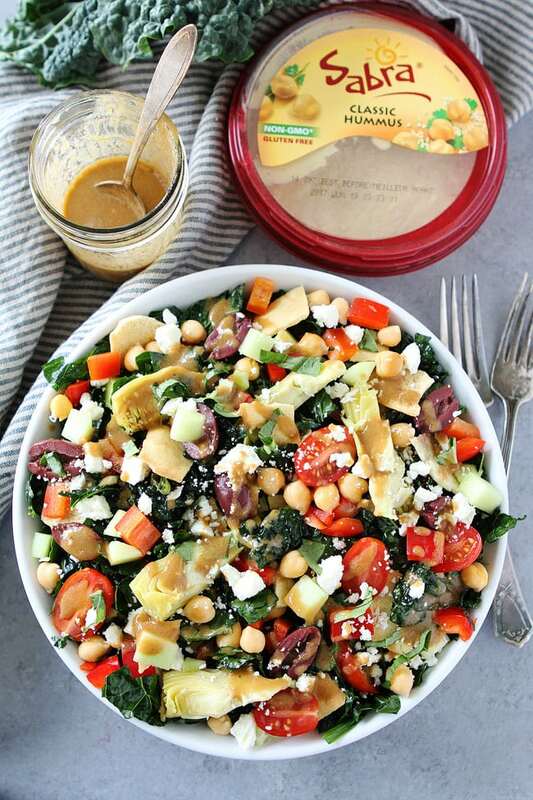 Mediterranean Kale Salad with chickpeas, tomatoes, cucumber, red pepper, artichoke hearts, olives, feta cheese, pita chips and a simple hummus dressing. 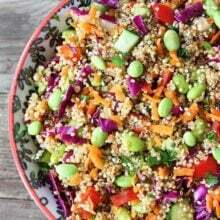 This simple and healthy salad is great as a side dish or main dish. First make the hummus dressing. In a small bowl or jar, combine the hummus, olive oil, lemon juice, and balsamic vinegar. Whisk until smooth and season with salt and pepper, to taste. If the dressing is too thick, add a little bit of water until it reaches your desired consistency. Set aside while you make the salad. 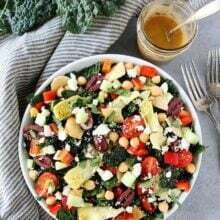 In a large bowl, add the kale, chickpeas, tomatoes, red pepper, cucumber, artichoke hearts, olives, feta cheese, pita chips, and basil. 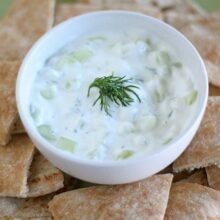 Drizzle with hummus dressing and toss. Serve immediately. hey girl- this looks amazing!! Healthy, easy, beautiful, thank you, you rock! Oh, wow, I love the sound of that hummus dressing! This is a great salad! I’ve made it on two occasions. The first with the original salad ingredients. The second time I had jalapeño cilantro hummussi I added avocado in place of the artichoke hearts and cilantro instead of basil. I crumbled queso fresco instead of feta. I also added some leftover chicken breast. Both teams mes it hit rave reviews. I’ve passed it on to friends who really liked it too. Glad you like the salad! This looks SOO GOOD!!! I love summer salads! I will make this dish to replace rice meal. Recently I am quite bored with rice. I could eat this every night! Tried it with Kale the first time, Spinach the second. Fabulous! 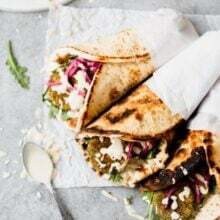 Hi how do you think this would be without the feta?